Photo provided by Chris Barsby, taken in August 1914 when an aeroplane made an unexpected touchdown. Chris writes... "It's one of my Dad's old photos and it would be interesting to get some background to it. You can tell it is South Craven's field as there is the little stone barn which was down the lane that went from the back of the Old White Bear in Cross Hills down to the back of the hen farm. You can also see Eastburn quarry and the Ravenstones in the background." "Many Sutton folk had their first sight of an aeroplane in August 1914 when it landed on what is now a part of the South Craven playing fields. The pilot was a Mr Hucks, taking part in the London to Manchester air race, but shortage of petrol forced him to come down. 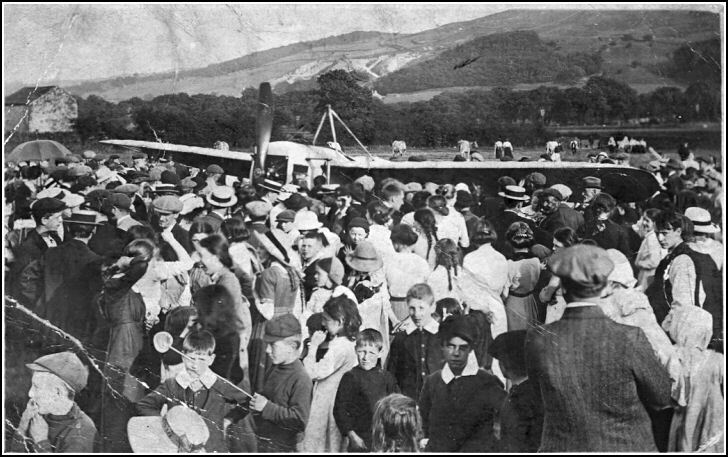 Great crowds gathered round the aeroplane, and by all accounts Mr Hucks was very pleased with the reception he received. Petrol was obtained from Hanson's garage, but before taking off, the pilot had a meal with the folk around." A quick search on Google reveals that Mr Hucks could have been Bentfield Charles Hucks, the first Englishman to fly upside down and famous for doing the "loop the loop".